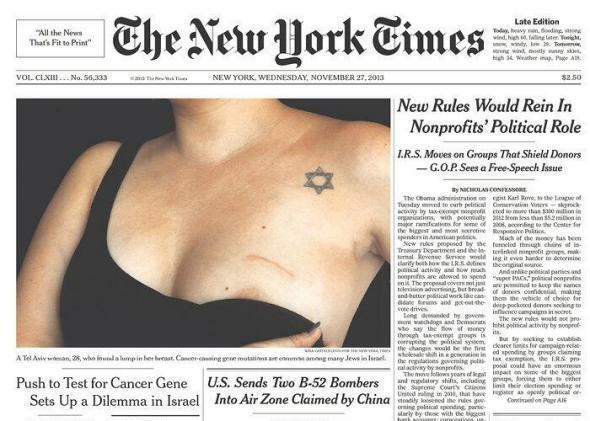 The New York Times breast cancer front page: The paper was right to run that photo. The understandable agony of deciding whether or not to remove a part of one’s body, the extremely difficult calculus involved in weighing one’s health options, others’ empathy for that agony—none of these are remotely equivalent to perceiving women as “life support for delicious breasts.” Lots of misogynist trolls think that way, sure. And some of the Israeli doctors referred to in the piece seem to as well. But an areola on the cover of the Times does nothing to validate the views of misogynist trolls or moronic physicians. If anything, it’s a welcome step forward in dissipating the misogyny-driven occult power around the terrifying and mysterious breast, whether the issue is the BRCA1 genetic mutation or feeding one’s baby in public. Marcotte writes that her heart is with those of us who despise Puritan prudery, but a puritanical society is exactly what equates “breast” with “WTF traffic.” The Times picture doesn’t strengthen the taboo—it dismantles it. Demystifying the breast is good for women. The Times got this one right.